Brazil faces Mexico in the round of 16 at Samara Arena in Moscow, and with Germany, Argentina and Portugal already eliminated, a victory would make the five-time World Cup champions one of the top bets to take the title. Mexico, meanwhile, is seeking the elusive “quinto partido” – fifth game, a trip to the quarterfinals – for the first time since 1986. El Tri has made it to the round of 16 for the past six tournaments, only to stall out at that stage. Mexico pulled off an upset by beating Germany 1-0 in the group opener for its first victory over the four-time champions in a competitive match. Belgium is the leading scorer of the World Cup and faces Asia’s last remaining representative at the final match hosted at Rostov Arena. Belgium has been led by Romelu Lukaku, who has four goals in the tournament and trails only the five scored by England striker Harry Kane. Japan should be led by former Manchester United forward Shinji Kagawa and Keisuke Honda, a former AC Milan player who is dangerous on free kicks. 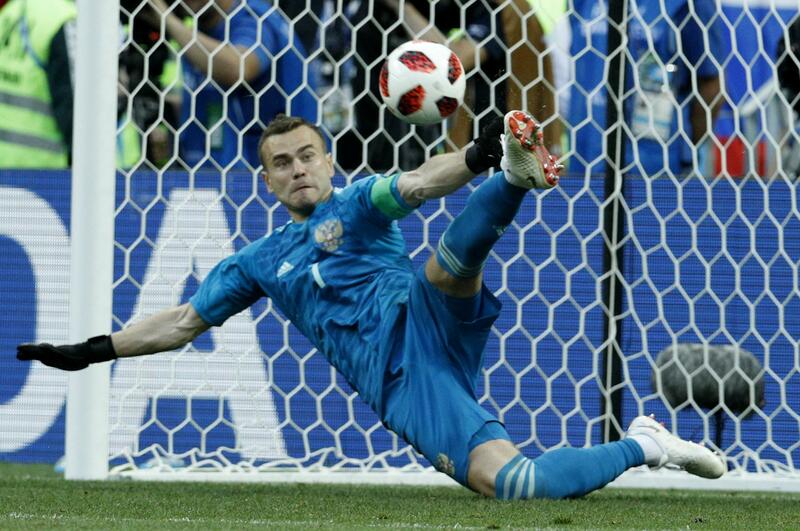 MOSCOW – Stretching every part of his body out into a star shape and diving to his right, Igor Akinfeev flicked out his left foot and kicked the ball high away from danger. Akinfeev’s foot kept Russia’s party going Sunday night, ended the international career of one of Spain’s biggest stars and sealed the biggest upset of the tournament and one of the greatest in World Cup history. Akinfeev saved two shots during the shootout, while all of his teammates scored to give Russia a 4-3 advantage after a draw that was dominated by Spain in every way but the 1-1 score. Russia – the lowest ranked team in the World Cup at No. 70 in the world – is stunningly going to the quarterfinals to face Croatia or Denmark on Saturday. Millions of Russian fans, many of whom were mocking this team just a couple of weeks ago, are jumping loudly on the bandwagon. Akinfeev’s winning save against forward Iago Aspas made the national stadium in Moscow shake with the roar of around 70,000 Russians celebrating their team’s best World Cup run since it was the Soviet Union in 1966. It was a shocking elimination for Spain, joining former champions Germany and Argentina. Still, World Cup history was on Russia’s side after its well-organized team survived two hours of barely having the ball. Russia extended a streak of World Cup hosts winning penalty shootouts to five. France, South Korea, Germany and Brazil have also won shootouts since 1998. Akinfeev ensured that, in the 32-year-old captain’s 111th game for his country. With Spain taking first, the shootout was poised at 2-2 when Akinfeev dived to his right to push away the kick by Jorge “Koke” Resurreccion. The Atletico Madrid midfielder lifted his shirt over his eyes in dismay. Russian penalty kickers were perfect against Spain’s struggling goalkeeper David De Gea. After Akinfeev acrobatically blocked the left-footed shot of Aspas, he leapt up, punched the air with both hands and dove into a belly flop cross the rain-soaked turf as teammates raced to him from the halfway line. It gave Russia its greatest win in 10 years, since Akinfeev was in goal for an extra-time victory over the Netherlands in a European Championship quarterfinal. That run was ended days later by a Spain team beginning its era of dominance. Spain has now failed to win a knockout game at three major tournaments since it won Euro 2012, its third straight major title after Euro 2008 and the 2010 World Cup. Published: July 1, 2018, 8:01 p.m.